A brush fire broke out Saturday at the southern end of Vandenberg Air Force Base. The blaze spread over the weekend and led to the second postponement of the launch of the Atlas V rocket. 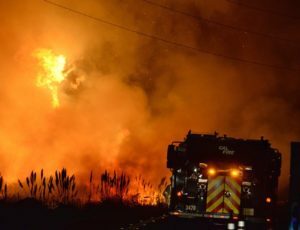 The Vandenberg blaze, which officials have dubbed the Canyon Fire, has burned about 4,500 acres with no containment, as of Monday morning. No structures have been damaged, but 400 residents in San Miguelito Canyon received evacuation orders. Officials have not reported any injuries. 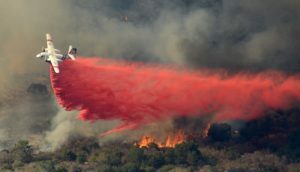 Several agencies, including the Vandenberg Fire Department and the Santa Barbara and San Luis Obispo County fire departments, have responded to the fire. Helicopters and air tankers are assisting ground crews battling the blaze. The Atlas V rocket was scheduled to take off Sunday and carry a commercial satellite, WorldView-4, which snaps high-resolution images of Earth. The WorldView-4 launch was originally scheduled for Friday, but it was postponed until Sunday due to a minor leak that occurred while loading fuel. The launch is now delayed until at least Sept. 26, according to United Launch Alliance, a joint venture of Lockheed Martin and Boeing Co.